One of the key elements for a light setup using Blender Cycles and Eevee is an environment texture applied to the scene. Some artists still prefer to use a plain white background, but you wonâ€™t get reflections and light variations from something like an HDRI map. The best place to get those textures for Blender is HDRI Haven, which offers those maps at no cost and with a creative commons zero licenses. You can even redistribute the map with your source files if your client requires such material. They just released a brand new map for outdoor scenes at night. 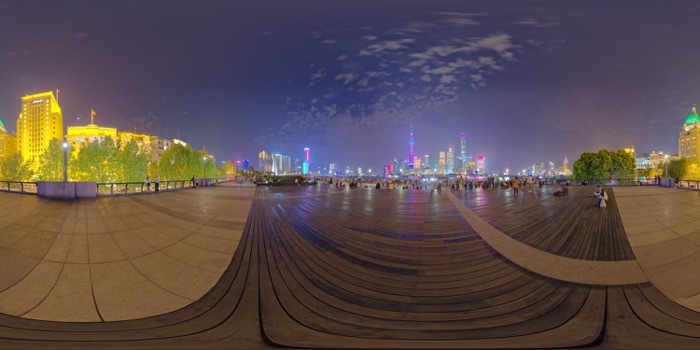 The map has a name of â€œShanghai Bundâ€ and features a view Shanghai with the skyscrapers in the background. A resource for a night scene in Blender. What about resolution? You will find download options starting with a humble 1024 x 512 pixels and going up to a massive 16384 x 8192 pixels. Did I mention that you can download that for free?